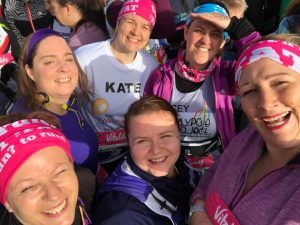 Continuing with our Clubhouse blogging takeover, today’s blog is a review of the Vitality Big Half race that many of our members took part in over the weekend. 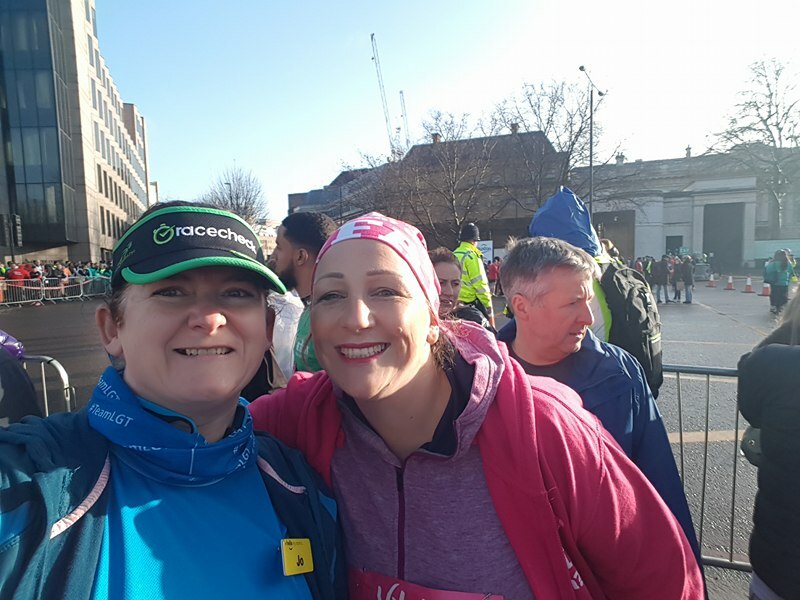 Clubhouse member Jo Gennari has done a wonderful job of recruiting and supporting runners in her own workplace and I was so chuffed to bump into her at the start for a little hug and a selfie. 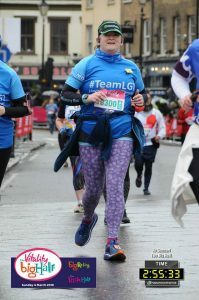 As a runner working in the boroughs of Lewisham and Greenwich and representing one of the main community groups taking part I was really pleased the Big Half was able to go ahead despite the best efforts of the Beast from the East. I found the pre race briefing packs and instructions clear and concise, my only small improvement would be to put names on the bibs, a lot of small races can do this and it’s a real boost when people can cheer you on properly. I was in Green G as a slower runner and the start area was well laid out with a speedy bag drop and the most portaloos I have ever seen at start. ( everyone knows how much queues for the loos at the start cause irritation!). I saw so many people I knew in the start and managed to grab a hug with Julie and the Clubhouse runners as well as meet up with many of our team of 100 NHS staff. We set off at about 9:25 as all the waves set off with a few minutes between them to avoid a mass stampede. In terms of the route much of the area north of the river is built up and commercial and included the longest tunnel ( Limehouse) I have ever run through – there was lots of frustration as it clearly impacted on the GPS for running watches and was my lowlight of the course. The cobbled areas through Wapping were a challenge as the course was still wet after the snow but that gave me an excuse to run/walk! Given the cold weather there were still a good number on supporters on many parts of the course and amazing support from the many volunteers and marshalls who were truly amazing all the way round. 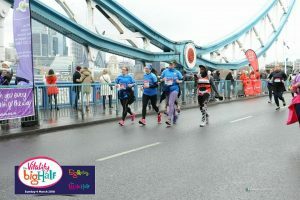 I loved crossing the iconic Tower Bridge which was rowdy with support groups and a real boost at mile 7. South of the river we ran through Southwark, Lewisham and Greenwich – the course itself was not scenic really and this was just time to get your head down and push on. I ran walked the course with one of my beginners group which helped when the crowds thinned out. There were 4 well placed drink stops with small (perfect sized) bottles of water and one stop with cups of Lucozade. Given the weather I think this was just about perfect and again the volunteers at these stops were really encouraging and friendly despite the cold. The entry into Greenwich and the finish at the Cutty Sark was incredibly well supported and noisy which really lifted the spirits. I loved crossing the line next to the Cutty Sark as this is an area I train in regularly and it was really special. The goody bag was a little disappointing just a couple of drinks and a cereal bar – but I am always spoilt after running the Mad Dog races !! the finishers t shirt was great and I am proudly showing off the medal. Brilliant race recap Jo, agree that the finish line area was brilliant. A well-organised event which is sure to grow in popularity year on year…and without the beast from the east to contend with. so what did my other ladies think of the race? The atmosphere was amazing. The support of Clubhouse ladies and the spectators made it really special. I loved the race, I love London and love running in London. I was running for a local charity in Milton Keynes so I was doing it for them and all of the people who had sponsored me. My 3 favourite things about the race were 1. The prerace meet up with the TFTR lovelies it was fabulous to all start together. 2. All of the support on the course everyone cheering my name thanks to my charity top that included my name in large letters. When I finish I felt like a super star with all of the cheers and 3. Running across Tower Bridge!!! Oh and a little thing of a new half marathon PB 2:56:32 all in all an excellent race with fantastic bling!! If you would like to join our incredible community of runners in our unique online running club the Clubhouse click here. With training support, virtual partners, meetups, guest experts, love, and support…The Clubhouse really is the friendliest space online for runners like you and me. The next time I am in the UK, I am determined to find a race with as many of you as possible. This sounds like it was great fun!